With more than 30 years of service in Missouri, we’re showing our commitment to the state in a big way! 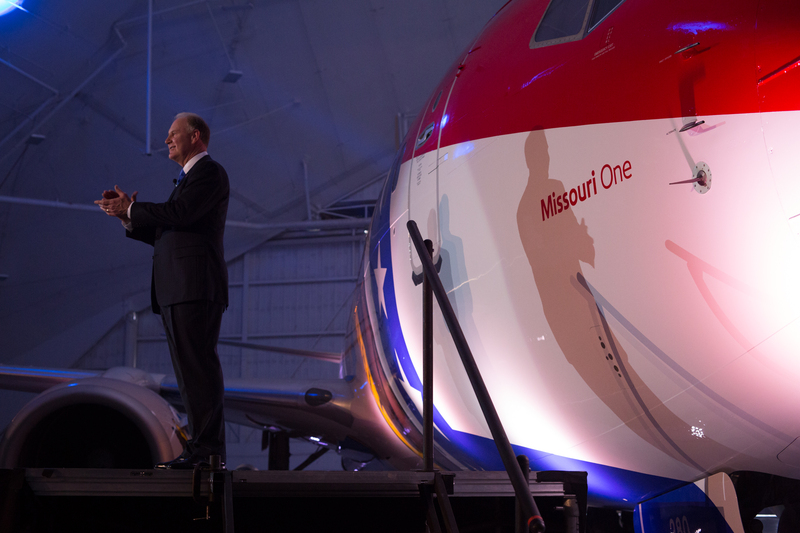 Earlier today at the Aviation Technical Services hangar at Kansas City International Airport (the first Show-Me State city we served), Southwest introduced the latest addition to our fleet—Missouri One! 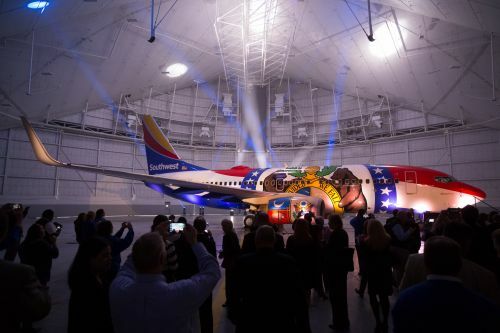 She is a 737-700 that is emblazoned with an artist’s rendition of the Missouri state flag. Southwest Airlines’ Kansas City Employees, community partners, and local dignitaries celebrated the unveiling at a “show time”-themed party alongside Southwest Chairman, President, and CEO Gary Kelly, Missouri Governor Jay Nixon, Kansas City Mayor Sly James, and myself. It was great seeing many of our Southwest supporters and honoring our longstanding partnership with the state! After kicking off the show in a reception area, we marshalled the audience into a separate room for an amazing video that revealed our big surprise. When the video screen dropped, our enthusiastic audience had their first look at Missouri One, which was waiting in the hangar, ready for her debut. In addition to the unveiling, we continued to share our Southwest Spirit with the state by making a donation to Kansas City’s Science City at Union Station to support summer camps that encourage local students to explore their interests in engineering, science, and technology. After the festivities in Kansas City conclude, this Missouri bird will fly over to Lambert-St. Louis International Airport to keep the party going with our STL-based Employees, community partners, and local dignitaries, including St. Louis Mayor Francis Slay. We are also making a donation to the St. Louis Science Center to help fund scholarships for their flight academy camp. “Kansas City and St. Louis have been vital cities in our network for more than 30 years,” Gary Kelly said. 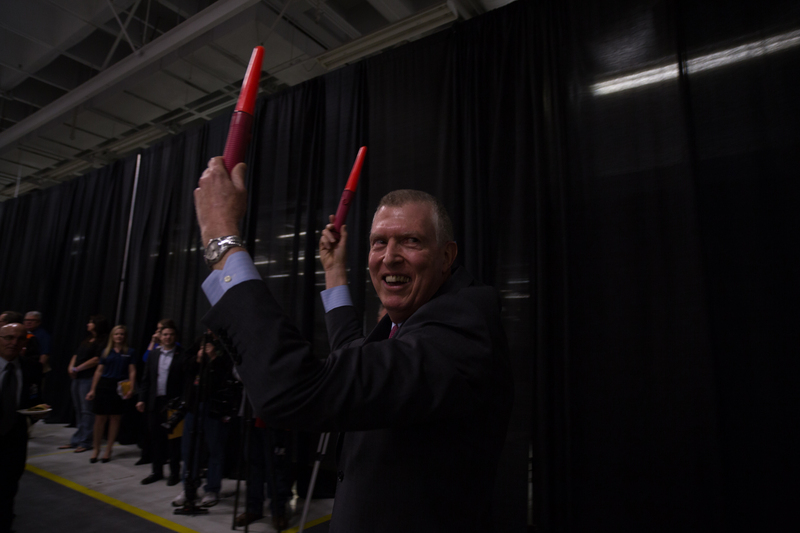 “I couldn’t think of a better way to ‘show’ our love to our Employees, Customers, and friends in the great state of Missouri than by dedicating this high-flying salute to them!” Southwest has been showing Missourians our legendary service since we began serving Kansas City in 1982 and St. Louis in 1985. After Gary announced in 2004 that Southwest would pursue an end to the Wright Amendment, one of our biggest supporters was Former Missouri Senator Kit Bond, who introduced a bill providing an exemption to the Wright Amendment for Missouri. This led to the start of nonstop service to Kansas City and St. Louis from Love Field on December 13, 2005. Today, Missouri is Southwest’s ninth-largest state in terms of daily departures. Missouri One joins nine other 737s in Southwest’s fleet that carry unique state paint schemes. Watch the above time-lapse video to watch the transformation unfold and check back later today for photos from the celebration!